Single motor synchronises conveyor, starwheels and platform turret and speed can be varied by the % speed pot on operating panel. A photosensing device stops machine automatically in the event, there is no aluminium cap in delivery chute. 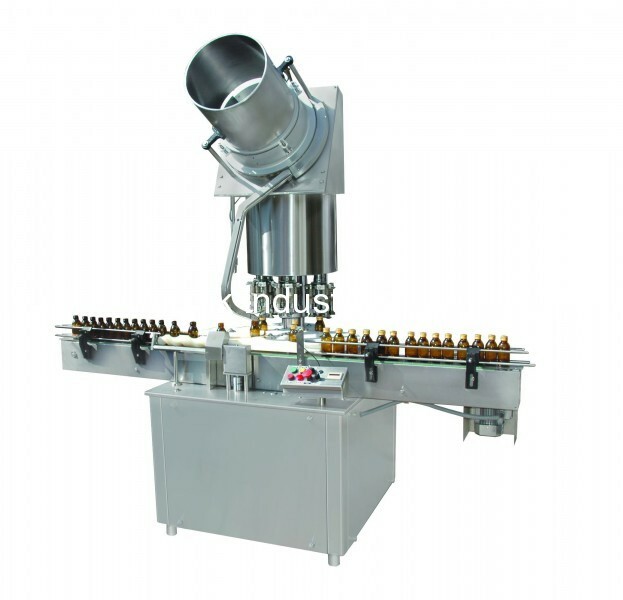 Automatic multi head ROPP Cap sealing Machine is a compact model used for sealing of ROPP Caps on the bottle. ROPP caps kept in orientation unit automatically orient caps in right direction before entering into delivery chute. And Bottle is entering below the sealing head, consist of total four rollers. Two rollers properly Skirts, Spins and Seals the cap and simultaneously another two roller performs perfect threading according to bottle neck diameter.